Wellington is already underway with its painting! Alan Hollows, Terry Swain, Paul Goldstone and Russ Briant had a busy painting session today. Alan's first batch of ten Turks are shown above. They're almost finished, just needing to be tidied-up. There's more info and pics of this productive day on the Wellington regional forum. Great start lads! Hopefully we will be underway soon! Great to see the painting has begun. I can't wait for the troops to arrive here. Good stuff - and what a brilliantly cool project! 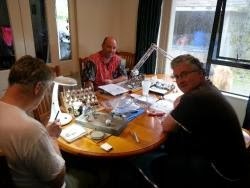 I am very much looking forward to seeing the finished diorama - a totally New Zealand creation on so many levels! Thanks for that, Matthew. It is great that authors of books on Gallipoli are dropping by to watch this project (for those who don't know, Matthew is the author of 'Shattered Glory: The New Zealand Experience at Gallipoli and the Western Front'). Apologies for the deleted post. Bungled attaching photo so here goes again. Have pretty much finished the charging ANZACs I was working on in the photo above.